Sometimes I let ideas come to me; sometimes I go out to find them. 1) I start at BabyNames.com, looking for the names of my next set of characters. I love names, so this is perhaps not a shocker. I have a penchant for short names that are uncommon without being ridiculous. It’s hard to explain how I know when I’ve found the right name– I just DO. Sometimes it feels more like archaeology than creation, as if I am simply unearthing what was waiting to be found as opposed to inventing what was waiting to be fashioned. 3) I like to have very, VERY large-scale idea of the plot– even if it’s just one sentence: girl in foster care falls in love. Or wards of the state experience hospice care. Or girl runs away with the carnival. I’m completely okay with leaving this idea zoomed out to 10,000 feet at this point. 4) Meanwhile, my characters need to have something they care about. Preferably it will be something I care about– at least enough to research and write about and live with for the next couple years. This search often involves Wikipedia and Quora, the public library and the university one. 5) Now I need a hook. What’s one fascinating idea these characters can explore? Again, lots and lots of research, including books of anecdotes, philosophy, mythology, symbolism, trivia. I read and read and read until something fits and I think, “Those are deep waters, and I’m ready to go from the shallow end into the depths.” At this point, I usually request one trillion library books and read everything I can find about this idea online. 6) I need to get to know my characters better, so I fill out two specific questionnaires about them. The first set of questions comes from Gotham Writers’ Workshop. The second set is from this Yingle Yangle post. By the time I’ve finished filling these out, I usually have a whole boatload of ideas for scenes. 7) I finally start to write. How about you? 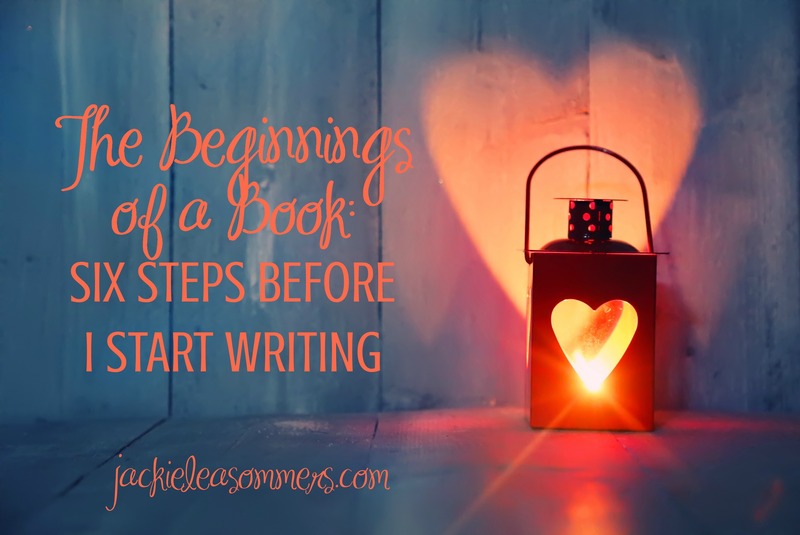 What are your earliest steps of writing stories? This entry was posted in creativity, real life, writing, YA and tagged brainstorming story ideas, coming up with story ideas, how i come up with story ideas, how i start writing a book, jackie lea sommers how i start writing a book, the earliest stages of a book by Jackie Lea Sommers. Bookmark the permalink. I start with names too (love them) but I’ve never looked for faces before. I might have to try that! I am not naturally good at description, so I rely heavily on images to help me in that area!! I’m terrible at descriptions true. Sometimes I try to draw my characters … but I can’t draw at all. I might try your trick and see if that works better! I’m more of a sit down and start typing. Dive straight in. I do like to have my names figured out first though. I’ll usually have a good idea about how I will begin, definitely know how it will end, and some plot points in between and then I write away. I’ll usually research as necessary as I go. So interesting how everyone does things differently! I usually do NOT know the ending when I start … sometimes not for a year or so! interesting blog post-more of this please!! !